The aim of this study was to evaluate the effects of chromium exposure on the growth of P. subcapitata using the Central Composite Design (CCD) and Response Surface Methodology (RSM). The highest values for algal density and biomass were obtained in the longest exposure times and for the lowest chromium concentrations. The CCD used for the analysis of treatment combinations showed that a second order polynomial regression model was in good agreement with experimental results, with R 2 = 81.50 and 89.90; for algal density and biomass (p < 0.05), respectively. Only the exposure time was significant for algal density. For chlorophyll, in contrast, the exposure time, chromium concentration and their interaction significantly affected the growth of P. subcapitata. 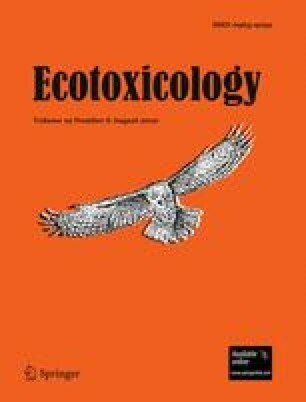 The findings confirmed the sensitivity of P. subcapitata to chromium (VI), which makes it a suitable bioindicator of environmental contamination for this metal. We are grateful for the financial support from the São Carlos Engineering School, the Water Resources and Applied Ecology Center, and the University of São Paulo, and for the assistance from the University State of West Center. We wish to thank Dr. Liane Biehl Printes for the valuable comments and suggestions on the manuscript.